The best limo buses, the best chauffeurs, and the best services... Period! ...in one of the most Amazing vehicles imaginable! Great way to transport all your guests while keeping them entertained. We have elegant vehicles that are perfect for your wedding day, plus exciting wedding packages that will add sparkle and glitz to an already magical evening! Enjoy quality time with your wedding party too, as you travel from chapel to reception hall! 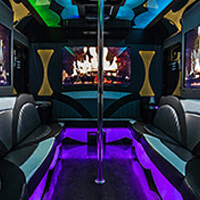 Our buses come equipped with stripper poles and even built-in bars! You can party it up like a wild child even in between bars and clubs! Live it up like a celebrity and feel like a million bucks when you travel with us! Visit all the hottest night spots in our area and have the time of your life! 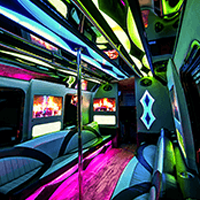 Be the envy of your friends as you arrive in your very own party bus or limo. Parents enjoy knowing that their teens are safe with us, and teens feel so loved because their parents are treating them to an unforgettable night that celebrates their transition into adulthood! So much to celebrate, so do it safely with us! You can enjoy the traffic while on a party bus, then we do the parking! This is great for concerts too, when you want to be able to enjoy the entertainment and not have to fuss with the frustrations of traffic jams and parking struggles! You'll feel like you've got your own glam tour bus when you're with us! 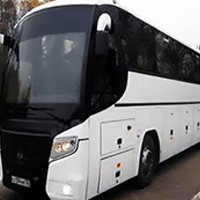 When you're looking to furnish luxury transportation for your special event in Fort Lauderdale or the surrounding metro area, then this is definitely the place for you. We can easily assist you if you're organizing any type of function. Examples of the events that we specialize in are tailgating, bachelor / bachelorette parties, weddings, bar crawls, and wine tastings to name just a few, so we'll be in the position to supply you with any of our stunning vehicles for literally any function that you choose. With our cheap and affordable booking rates, luxury transportation is more accessible than ever! We are capable of accommodating all kinds of events, itineraries, and schedules with our professional Fort Lauderdale party bus. 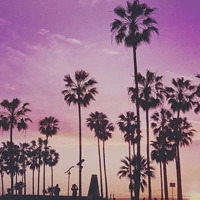 Since we have begun doing business in Fort Lauderdale, we have become one of the most trusted sources in providing luxury transportation for all our guests. 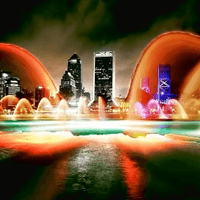 You will not find better luxury party bus service in Fort Lauderdale! No other company can compare, when offering you amnesties and features for your trip, at low rates. The features that come standard in each and every one of our buses include the following: premium wraparound leather seating around the interior, flat screen televisions with DVD players for your entertainment, powerful sound systems that include both CD player capabilities and iPod docks as well as sub-woofers, built in bars and coolers that come stocked with ice, and beautifully vibrant lighting to really set off the night just perfectly. All of our vehicles come with these deluxe features that make them some of the most unique and incredible vehicles in Fort Lauderdale. Are you ready to hit the road with us and experience one of the most fun times that you've ever had? It's like adding a party on top of the party, since you can keep the fun times going in the bus in between destinations. 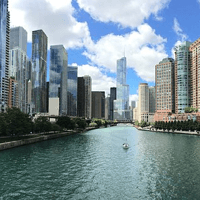 Whether you're hitting up a number of local bars, clubs, and restaurants, or just going between your place and the concert venue, you can enjoy that time on the road like you never have before. It's a world away from traveling in your own vehicle, with spaciousness instead of cramped seating, a booming stereo system and HDTVs that you can enjoy while on the go, and of course a built-in bar which is fully legal for you to enjoy while you travel with us! You certainly cannot do that in your own car! Now, if you'd like to speak to someone about getting a free instant price quote, or if you're far enough in the planning process that you are ready to book your bus, you can give us a call at the number at the top of this page, or click the envelope next to it to shoot us a quick email! We're here 24/7 to take care of you, and we provide transportation services around the clock too. We can provide an instant price quote with absolutely no obligation and no personal information, and we can lock down your desired date of service and book your bus with a quick credit card deposit. It's that easy, and it can all be done in just a few minutes. We are always here to address any questions or concerns that you may have, and we welcome you to browse our buses here on the site or come look at them in person if you prefer! Call or email us tonight and let's get started planning your once in a lifetime trip! Don't know which vehicle to choose? Find out about our fleet here! Want to know a bit about our company? Copyright © 2019 | Fort Lauderdale Party Buses | 313 SW 16th St, Fort Lauderdale, FL 33315 | All Rights Reserved.